The Larkin Block was built by Alexander Larkin in 1908. The three story building sat on the south side of Crowfoot Street between 4th and 5th avenue, on the site currently occupied by the hotel. The top floor was where the Mason Lodge had their rooms. The second floor was for living quarters and the main floor was dedicated to business. The business was called the Star Bakery and Confectionery. The first batch of bread came out of the oven April 02, 1908. It is not known when the third floor was taken off. R.W. Brown came to Gleichen in 1917 and bought the Larkin building. They operated the Star Bakery and Confectionery from 1917 to 1936. In 1936, Bob Brown (a son) and his wife Monnie took over the business and turned it into a general store, using one side as the store and the other side for a warehouse. The store was called, “Red and White”. Bob passed away in 1966. Monnie carried on operating the store and later sold it to Ron Sauve in the late sixties. When the building was finally torn down the ovens were still in the basement. 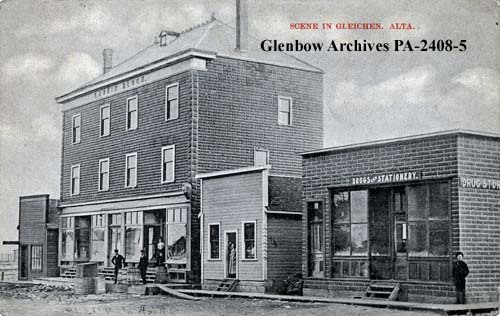 The Glenbow has a 1908 postcard showing the Larken block on the left and the drug store on the right.